Image caption What next for Los 33? Camp Hope is slowly emptying. Relatives of those miners who have already been hauled to safety have relocated to the hospital in nearby Copiapo, where the men are being treated. The shrines they had built to them now are no longer needed. The candles in front of their pictures remain unlit. And without constant sweeping, the men's photographs and banners are quickly covered in the dust of the Atacama desert. Few will miss this desolate spot, a 30-minute drive from the nearest town along a winding dirt road. Lucy Herrera, the sister of Daniel Herrera, the 16th miner to be rescued, says she hopes she will never see this part of the world again. She cannot wait to spend some time with her younger brother. But, she says, she would like to catch up with him far away from here. Most of the men who were trapped in the 5 August rockfall come from mining families. But Daniel, 27, is not one of them, he was not even a miner, just a driver who happened to work inside a mine. So his relatives are keen to go back to their home town of Marchigue. Maybe it's time we all started concentrating on the vital things in life, and these two months have shown that everyone counts! There, his aunts and uncles have spent the time he was underground finishing off an annex to his mother's home, which will serve as his new home when he gets back. His mother, Alicia, says she has no idea what tiles and furnishings they have chosen. She had not allowed herself to look beyond the moment of her son's rescue. She says she only managed to survive the first 17 days - when no-one knew whether the trapped men were alive or dead - by living from one Mass to another. Now, for the first time in 70 days, she can again think about more mundane things, but insists she has learned important lessons during the past two months. And her young nephew, Cristian, echoes her thoughts. He smuggled a bottle of champagne into the camp to celebrate his uncle's rescue. Spraying the assembled journalists with bubbly and punching the air, he gave an impassioned speech. "In this world we worry so much about insignificant things, while these 33 men were trapped underground just trying to survive," he says. "Maybe it's time we all started concentrating on the vital things in life, and these two months have shown that everyone counts!" 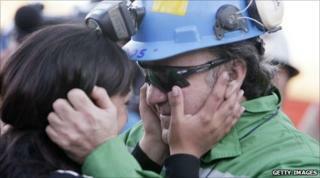 Lilian Ramirez's husband, Mario Gomez, the ninth man rescued, has been a miner for more than 30 years. She is by no means convinced he will stay over ground, even after what happened to him. In one of the letters she wrote to him, she told him he would have to retire from mining for good if their marriage was to work. After his rescue, one of the first questions journalists ask her is if he has agreed to her terms. She says she did not bring the topic up when he first stepped out of the capsule. "I was just lost for words for the first few moments," she says. "Then, I told him I loved him." But is she afraid he may go back to mining? It is not something she could dictate to him, she says. "But let's put it this way: he owes me big time. We're talking at least a long holiday, just the two of us, away from it all. Maybe a cruise, as far away from tunnels and shafts as you can get!" Maria Segovia wants to have a stern word with her brother, too. "I'm going to give him a good kicking," the sister of Dario Segovia says. She says he had been complaining about the safety of the mine even before the rockfall. "He said the mine was crying, and he went in anyway, how stupid is that?" she says, referring to the term miners use when rocks fall from the roof of tunnels. "Hopefully this will teach us not to chase money, but to be humble and treasure our friends and family instead," she says. Maria cannot forget that Dario was not due to work the shift when the rockfall happened. He was offered a double shift for double pay, and jumped at the chance of earning some money towards the greengrocer's shop he wants to open. But Maria, unlike some of the other relatives, thinks it is important not to abandon Camp Hope altogether. She promised to stay until the last miner was out, even though her brother - number 20 on the list - was transported earlier to hospital. But more than that, she wants the families to gather here at key dates, to remember what happened and to share the unique insights she says they have gained. Lucy Herrera says wherever they are, the lessons they have learned at Camp Hope will stay with them. "My brother said it in one sentence as he came out of the capsule," she tells me, as she's packing up her belongings. Daniel had said: "Don't worry about me, my shift is finally over, and a new one is about to begin."